Now in its vibrant mid-sixties, the Grand Ole Opry has become a genuine American institution. With overtones of Horatio Alger, southern style, the Opry's story begins in November 1925 when a beareded old back-country musician brought his fiddle to radio station WSM in Nashville. 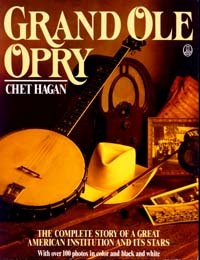 We may think of country-and-western stars riding in customized Cadillacs and wearing costumes studded with rhinestonesall true enoughbut in those first days of the Opry, the artists were likely to earn a living working a dirt farm or in a factory, and the Opry shows were aired from the National Life and Accident Insurance building. This pioneering radio station gave birth to what has become one of the most famous musical institutions in American history. How did a young student of elocution named Sarah Ophelia Colley create the character of Minnie Pearl, which she afterward played for life? Why did the famous Hank Williams leave the Opry after barely two years? And how did Roy Acuff, the first singer to become a star at a time when the main form of entertainment was the string band, make the Opry what it is today and earn the only permanent dressing room a star has ever had there? How the Grand Ole Opry became greatand inside stories from the lives of those who made it that wayis told in delightful anecdotes with over one hundred photographs, including eight pages in full color. Chet Hagan, an Emmy Award-winning producer and writer for NBC News for nineteen years, is a leading authority on country music. He produced the first televised Country Music Association Awards in 1969 and the Grand Ole Opry's 60th anniversary special in 1985. He has also produced many other major network TV specials with Johnny Cash, Crystal Gayle, Larry Gatlin, Dolly Parton, Eddy Arnold, Roy Acuff and many other country greats.